I was talking about straw-hauling after wheat harvest. The great incentive to finish with the straw was that we could then take a vacation, generally a camping trip up in the Cascade forests, far away from combines and chaff and straw piles. One afternoon in August 1945, as were topping out one of the main stacks in front of our house, we heard the Warm Springs mill whistle hoot over and over again. Presently an endless line of cars appeared on the highway, heading for town, horns blaring. Somebody who knew us leaned out of his window and hollered, “THE WAR’S OVER—JAPS SURRENDERED—BIG SHINDIG IN TOWN TONIGHT!” We actually quit early, an unheard-of concession. I remember reflecting that if this had happened during harvest, we wouldn’t have paid any attention, and a few days later we would have been up in the mountains! Excellent timing, General McArthur! 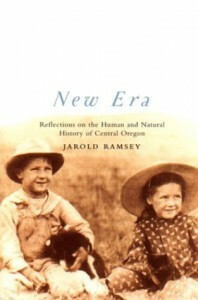 –from Jarold Ramsey’s NEW ERA: REFLECTIONS ON THE HUMAN AND NATURAL HISTORY OF CENTRAL OREGON, 2003.